University, three roommates learning to cook (and impress the guys). One time we decided to bake chocolate chip cookies, but five minutes of research revealed dozens of recipes as different as the women that bake them. Well, then, how is one supposed to choose a good recipe? How do I know it won’t be too crunchy? or flat? or bland? Think, think, think. And a great idea came to us. The men’s dorm was having a big party, let’s just bake all of the recipes and have a taste-testing!!! The best recipe would be treasured for a lifetime. I half-expected there to be a tie. The recipes were as different as they get, some sharing only the chocolate morsels and flour as common components. But different people have different expectations of their chocolate chip cookies, as you may know. None-the-less the results of the taste-test were unanimous. I mean, one hundred strapping young men, and they all agreed on one thing – gooey! 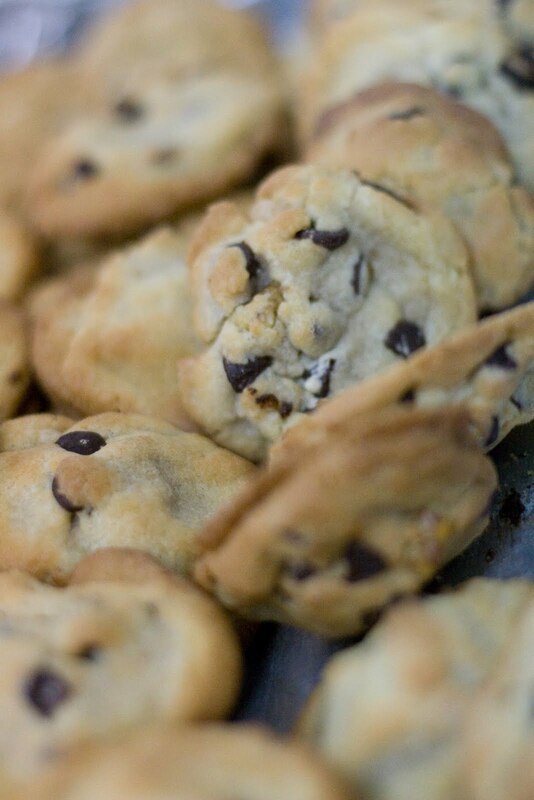 So if you’re looking for a chocolate chip cookie that is soft, chewy, and gooey in the middle … even the next day, then you’ve come to the right place! In my opinion a good chocolate chip recipe should never make less than six dozen. So here goes, enjoy! Cream the first five ingredients. Add flour and dry ingredients slowly. Bake at 350°F for 8-10min (200°C for 6min). Special thanks to Dana Shaffer who first published this recipe in the Baptist Church Cookbook!